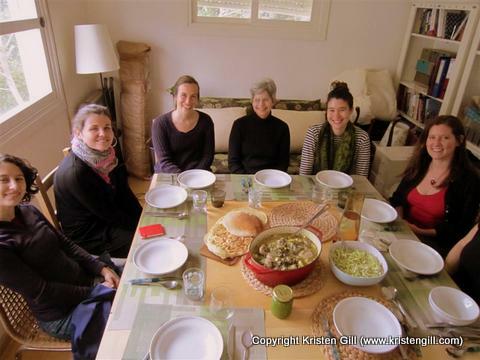 One of the best things I did during my recent Israeli adventure was to take a Hebrew Cooking/Language class with two very interesting Tel Avivians, whom I met through mutual friends. 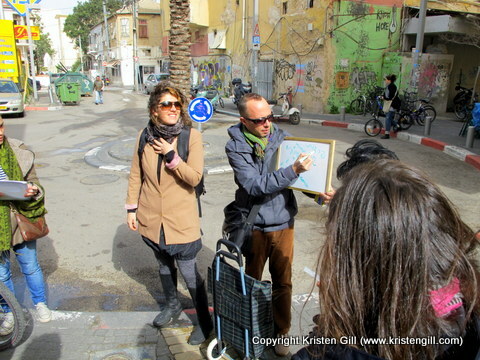 Together, Nomi Zysblat and Guy Sharett run their class that starts at the Shuk HaCarmel in central Tel Aviv and ends up at Nomi’s kitchen in the chic Bauhaus neighborhood. 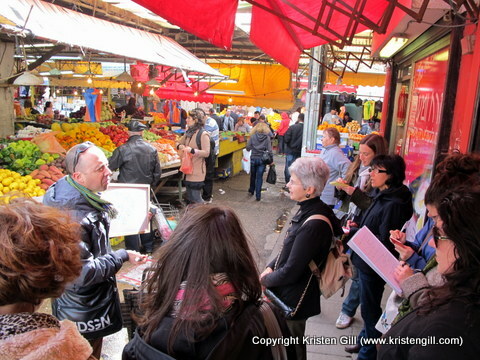 This three-part excursion, meant to stimulate all the senses, combines Israeli food with Hebrew language fun: market tour, cooking class, and group lunch. We started the morning with a tour of Shuk HaCarmel, the local outdoor market, where Guy introduced a selection of treats and his favorite vendors. 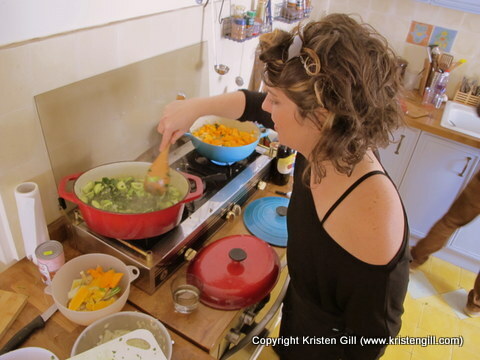 Next, we bought the ingredients needed for some classic Israeli dishes during a hands-on cooking class taught by Nomi Zysblat, a professional cook and musician, in her Bauhaus-style apartment located close to the market. We learned the ins and outs of Israeli cooking techniques as we reviewed the Hebrew words and expressions for the various steps and ingredients used in preparing our feast. For our meal, we made two types of Kubbeh soup: pumpkin soup and Hamousta soup. But, other traditional dishes might include Shakshuka, Roasted Eggplant, Roots Salad, and Tahini Cookies, among other delicacies. Finally, we sat down to lunch to enjoy our creations with our new friends. 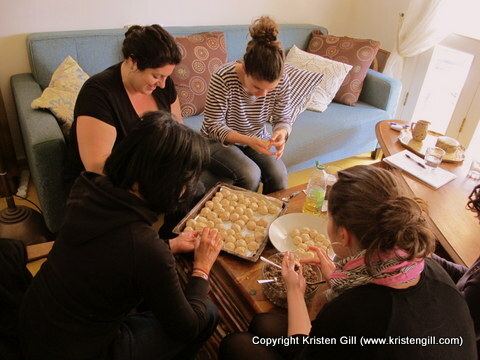 During this adventure, we cooked, laughed, tasted, and even sang, while practicing hands-on Hebrew. Bring your appetite and experience the warmth of gracious hosts and a tasty home-cooked meal! (Basic Hebrew a plus, but no previous cooking experience necessary.) What a way to satisfy both your culinary and linguistic cravings! Be sure to check out Guy Sharett’s “Streetwise Hebrew” fan page on Facebook, and keep an eye out for Nomi Zysblat’s homemade Paletas (delicious frozen fruit concoctions served on a stick). Eat Up, Speak Up, and Adventure On! Hello! Glad to have your blog and bookmarked now, also 🙂 I blog rather anonymously, but I’m sure you’ll know who this is toot-sweet. I’d have loved this – food and language being two of my great pleasures in life.